Many fans would agree that the Dark Knight series, directed by one of the best directors of this general, Christopher Nolan, is a true cult series, and gives a better view of Batman and Gotham than most movies. But ever since Ben Affleck took up the mantle of the caped crusader for Batman v Superman: Dawn of Justice, the internet has been take by a storm, with half of the DC fans routing for Affleck and his rugged looks as Batman, while the other half dissing at the decision taken by Warner Bros. to cast Ben Affleck as the Batman. 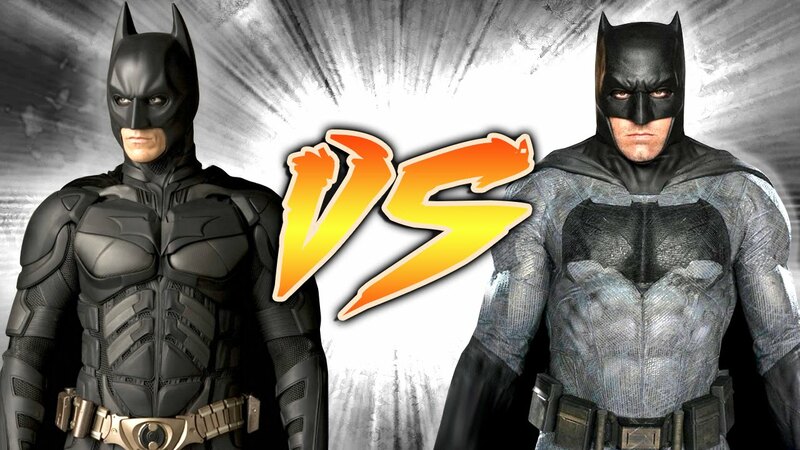 But while the world debates on this topic, let us take a look at the top 10 reasons as to why we think Ben Affleck is a better Batman than Christian Bale or any of the other actors that held the mantle. Read on to find out more. Christopher Nolan definitely gets points for a wonderful story and a definitely great script, but Christian Bale as Batman had no or little action in his loosely choreographed fight sequences. But when it comes to Ben Affleck, his fight and action sequences as Batman were definitely something to behold. Although done with an ample amount of suspension cables, Affleck’s Batman fought exactly like Batman should – hard hitting, and one punch concussive. We here at Top10Tale simply loved the way he fought off the Russian’s men in Batman v Superman, and would definitely love to see some more of such action sequences in the coming years. Christian Bale as Batman was much sleeker, and quite short to be honest. But Affleck’s Batman was much more bulky, definitely taller than most Batmen, and looked tremendously dangerous – which comic book lovers definitely loved. The Bat suit worn by Affleck was also quite comic book accurate, with authentic battle damage, which showed that Batman has been fighting criminals in Gotham for more than 20 years – just the way the comic book aficionados love him. We simply loved the fact that Nolan came up with an actual cave for Christian Bale’s Batman, but the Bat Cave in the Dark Knight series lacked a decent amount of tech. The Batmobile in the Dark Knight series was also quite unsatisfactory, as it looked more like an army tank. But Batfleck’s Batcave, shown in Batman v Superman and Justice League, was filled to the brim with some of the most advanced tech in the comic book world. The Batmobile driven by Affleck’s Batman was also comic book accurate, and looked simply awesome. When we see Ben Affleck take up the mantle of Bruce Wayne, he has already been Batman for more than 20 years. And with 20 years of crime fighting experience, and with certain trauma in the past, Affleck’s Batman has developed a more violent streak than other Batmen we have seen, which makes us love him even more. The “no killing rule” does not have much importance to him anymore – not as it did when he first donned the cape and cowl. This gives his character a definite, new edge. No matter how badly the movies of the DCEU might have performed, we still have to accept and love the fact that Ben Affleck’s Batman lives in the DC Extended Universe. That means he can come across other DC characters like Wonder Woman, Superman, The Flash, Aquaman, Cyborg, etc. Bale’s Batman lived in a sort of a stand-alone word, with only exclusive Batman villains and supporting characters. No other mention of any other DC character was ever made on any of the Nolan movies. Christopher Nolan might have had a great storyline and fantastic camera work, but what Zack Snyder did was take the Gotham in the comic books and bring it to life on our screens. Snyder showed Gotham as it should be – dark, gloomy, a hub for criminality, and Batman’s proverbial playground. He showed how the police are even afraid of Batman, whereas Nolan made the cops chase the Batman through two whole movies, which was absurd. With a darker Gotham filled with some of the worst criminals and awesome wall graffiti, Snyder and Batfleck wins our vote on this point. Nolan’s Batman was more of a fighter – all the detective work that Batman is usually expected to was either done by Michael Caine’s Alfred, or Morgan Freeman’s Lucius Fox, which was quite disappointing for comic book fans. But Ben Affleck as Batman did all the detective work by himself, with only minor assistance from Jeremy Irons’ Alfred. He used his detective shield to track down Luthor’s ship in Batman v Superman, and even used the same skills to find the Flash and Cyborg and have them join the Justice League. The level of analytical skills and problem solving capabilities that Batfleck portrayed truly won him the proverbial JAMES BOND OF SUPERHEROES title over every other Batmen. Michael Caine’s Alfred was all about life-lessons and timely advice, which was good, but turned out to be quite boring once he continued the same approach to the character in The Dark Knight Rises. But when Jeremy Irons took up the mantle of Alfred Pennyworth in Batman v Superman, we truly saw how technical Alfred can really be. Alfred acts as a mechanical engineer as well as communications engineer while he tunes up the Batmobile and rewires the Batsuit to avoid the voice modulator from shorting. This is the version of Alfred comic book fans are more acquainted it, so naturally loved Irons’ portrayal quite a lot. The broody looks and persona of Bruce Wayne, as seen in comic books, could not be pulled off by any of the Batmen, including Christian Bale, whose Bruce Wayne looked less like Wayne and more like Barry Allen or Ray Palmer. But the way Ben Affleck built himself up to play the role of Bruce Wayne, was perfectly commensurate with how Bruce Wayne really looks in the comic books. We saw Christian Bale living in a luxurious mansion or a luxurious penthouse, and driving around in costly cars throughout three movies. But Affleck’s Batman, or Bruce Wayne, lives in a lake house, and to be honest, only has a few luxury cars. This shows that he has suffered a lot in the last 20 years or so, which gives testament to the fact that he has a much darker backstory. Plus, we see the Joker’s spray-painted message on Robin’s suit, and we are instantly transported back to events of the Under the Red Hood storyline, which confirms the fact that he has faced quite a lot as Batman and as Bruce Wayne as well.